A GPS receiver (GPSr or simply GPS) receives satellite signals and displays your current position. By entering the coordinates of a geocache, a GPS receiver will typically display an arrow giving you the distance and bearing of the geocache. Modern GPS receivers operate on twelve channels, meaning they can pick up the signal from up to 12 of the 29 satellites in the GPS constellation. Older units operate on only 8 channels. 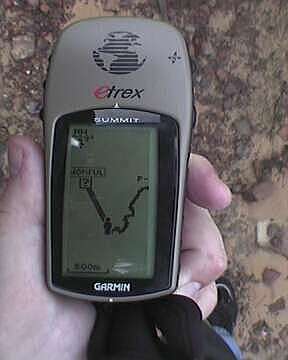 While these older units are still able to be used for geocaching, they are not as accurate. The most popular brands are Garmin, Magellan and Navman. Prices vary dramatically, so it's best to ask in the forum to see where to get one at the moment. Every now and again there are polls in the forum about the popularity of individual brands. Here's the most recent poll. The "EPE" or Accuracy does not mean what it appears. This page was last modified on 2 November 2007, at 19:53.